Gift wrapping is a skill that not all of us have managed to acquire. Worse, if you suffer from back pain, you are probably all too familiar with the strain you feel in your back when you’re sitting on the floor, bending over a pile of gifts with a scissors in one hand and a snarled mass of tape in the other. This year, avoid straining the discs in your lower back, aggravating your symptoms and potentially pulling your muscles. Instead of sitting on the floor, support your spine by sitting at the dining room table in a comfortable chair. Alternatively, use a waist level counter and wrap while standing. Wear supportive shoes if you prefer to wrap standing up. Whether sitting or standing, good posture is important. Before you start, gather what you need: tape, scissors, “to” and “from” tags, ribbon, bows, etc. Place the roll of paper towards the back of the table or counter so you can pull it towards you while unrolling. Avoid lunging or straining to grab items you can’t reach. It’s better to get up and walk towards the item if need be. Doing stretches before you start an activity—including gift wrapping—will loosen up your muscles and joints. Doing this minimizes the strain you put on those muscles and joints while you’re wrapping. If you do start to feel strain, take a break. Get up and walk around before resuming. You might find it easier to wrap a few items at a time rather than a single marathon session to wrap everything. It will certainly give your back more opportunities for a break. If your back, musculo-skeletal system and nervous system are in optimum condition, you will find gift wrapping—and all your other holiday activities—easier and more enjoyable. Don’t try to make wrapping paper fit around an oddly-shaped item. You’ll just get frustrated when the paper tears or sticks out at odd angles. It’s a lot easier to wrap a gift that’s in a square or rectangular box. It’s also harder for the recipient to guess what their present is. Rather than spend money on cardboard boxes, re-use some boxes you already have in your kitchen or paper recycling bin. Skip the paper and tape entirely. Use gift bags or reuseable gift boxes. You can get various sizes of festively-decorated boxes at the dollar store for reasonable prices. Add some ribbon and a little tissue paper and you have an attractively-wrapped present for much less work. Also, it’s good for the environment! 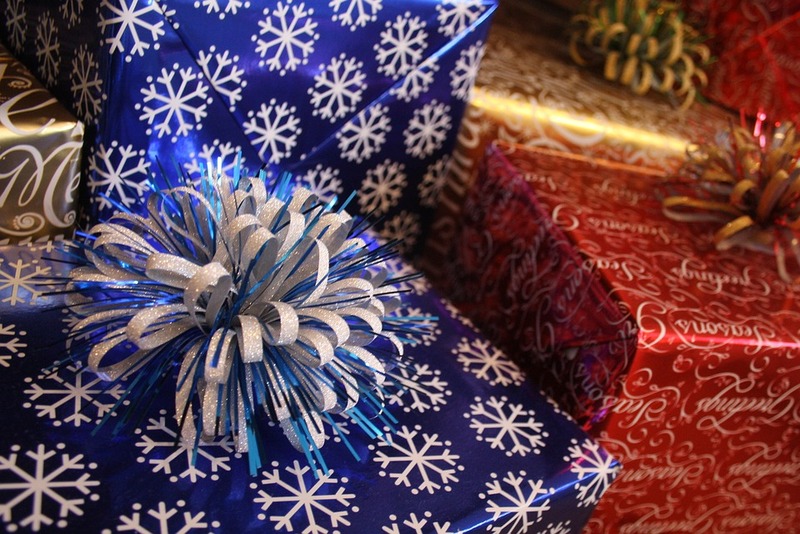 At this time of year, charities often set up gift-wrapping stations in the mall. The money goes to a good cause and you don’t have to do any of the gift wrap yourself.